Thanks to Richard Smith for the photos of 67 on the 72 yesterday! I believe that the crimson lake livery appeared on more buses than the Stenning scheme and lasted longer in the fleet but can anyone confirm this? anyone know the numbers to receive each livery? Agreed that Stenning does produce some stunning designs which can be seen elsewhere, including within Go Ahead Group. I am a fan of his work - just not this design which is too dark and bland. We dont know what the original brief was, so it may be that those colours were specified? Either way I personally wont miss it! Looks much classier and consistent than those amateur 'flash' brands! I personally really rather like the Stenning livery, by far superior to the currently livery! A real shame to see it go imo! Rather fitting though that the first PCB vehicle to wear the Stenning livery is also the last to lose it! Thought this livery was superb and more classy than the one now in use. However, the fleetname style wasn't great - 'Plymouth' was just too unreadable! This one looked smart on the Wright-bodoed buses when they were new; the chrome on the front relieved the dark red colour. It is, in a way, a pity the chrome could not have been retained on the Blue Flash livery. For the same reason, the Stenning livery die not look good on a Dart and was really gloomy and depressing on a double-decker. 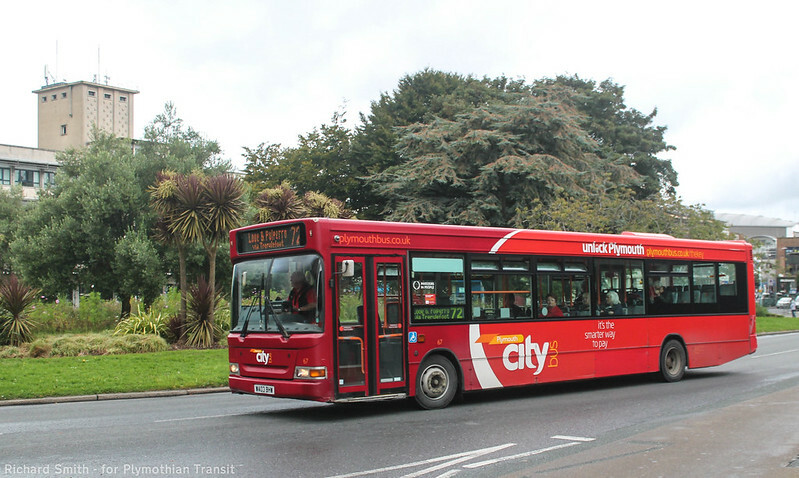 I believe the downsizing of the "Plymouth" part of the fleetname was because Best Impressions felt it was not necessary to state which city was involved when the buses were (at the time) not to be seen anywhere else. Indeed, given a free hand, I was told that it would have been done away with altogether, but politics dictated otherwise.